In a tense showdown on Capitol Hill, U.S. 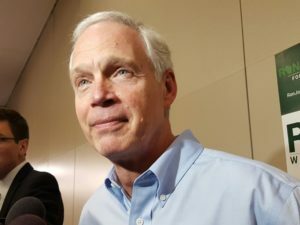 Senator Ron Johnson on Tuesday cast one of the deciding votes on whether the chamber would open debate on legislation to repeal and replace the Affordable Care Act. Johnson, who has been critical of Senate GOP leaderships’ handling of the process, was the last Senate Republican to cast their vote on a procedural motion that allows the debate to move forward. The Wisconsin Republican’s “yes” vote came moments after Sen. John McCain (R-AZ), who is battling cancer, came to the floor to cast his vote in favor of proceeding with the debate. All but two Republicans in the Senate voted in favor of open debate, with all Democrats opposing the vote. Vice President Mike Pence voted to break a 50-50 tie in the chamber. In a conference call with reporters after the vote, Johnson said he voted in favor of proceeding with debate in order to keep the process going. “If we didn’t proceed to a bill, the process would have ended – and the mess that is Obamacare would have remained in place,” he said. Johnson said it’s clear the Senate currently does not have any consensus on what a final bill should looked like, and pledged he would remain engaged in the process. The vote comes after months of pressure from the White House for Congress to move ahead with a promise to repeal the ACA, also known as “Obamacare,” and replace it with something else. What that replacement will look like still remains unknown though. While the Senate has introduced an initial version of its plan, the measure is expected to see changes in the coming hours as debate in the Senate moves forward.